Among the most worrisome findings are the corroborative results from several prospective cohort studies of children, which show an inverse dose–response effect of prenatal exposure to chlorpyrifos on cognition at 7 years of age.. In fact, one review (assuming a population of 25.5 million children 0 to 5 years of age in the United States) calculates a total loss of 16.9 million IQ points due to exposure to organophosphates, of which chlorpyrifos is the most widely used.. The EPA …may be putting an entire generation of young brains in harm’s way. 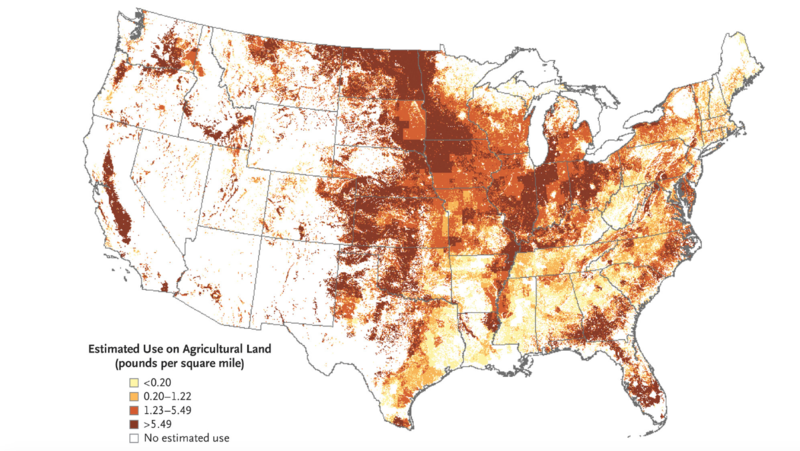 Estimated Agricultural Use for Chlorpyrifos, 2015 (Preliminary). Estimates are from the U.S. Geological Survey National Water-Quality Assessment Project. This entry was posted in Nutrition and tagged chlorpyrifos, EPA, organophosphate by gutsandgrowth. Bookmark the permalink.